Monday, 19 November 2018 | All American has cranked up his strike-rate with 8 winners in 4 days ahead of the 2019 Perth Magic Millions. His first WA yearlings conceived at Geisel Park will be targeted by local and international buyers following the four-nations blitz in New Zealand, Australia, Hong Kong and Singapore. All American sired three winners in 24 hours across the Tasman topped by 3yo filly Tiger Silk who will step up to black-type after breaking her maiden third time out at Ruakaka on Friday. The LR Trevor Eagle Memorial (1500m) is her immediate target on December 1. Collett bought her for $85,000 at the 2017 Inglis Classic Sale and she races for a partnership that includes his wife Judy and stable client Joanne Sims. Tiger Silk is a three-quarter sister to Bachman who was All American’s first Group winner in the 2014 Baillieu Hcp at Rosehill. Brasada was another very impressive maiden winner for All American during the tri-code meeting at Cranbourne on Saturday night. He still has a bit to learn but raw ability and a strong desire to find the line helped help break through at just his second start for trainers Leon and Troy Corstens. “He got a little stirred up and by the time he got around to the gates had almost forgot he was there to race,” Troy Corstens said. “Dylan Dunn improved his position after a slow start without much fuss and then headed to the centre of the track where he put in the big strides. Brasada is owned by Shane & Rebecca Morrissy and Dean Harvey of Baystone Farm. His USA dam Ranchy (Siphon) was bred by Overbrook Farm and was a 2yo winner in California. She is out of a half-sister to Overbrook legend Storm Cat. Elusive State continues to go from strength-to-strength for All American in Hong Kong while completing a hat-trick for trainer Tony Millard on Sunday. And he has more to give judging by the way he looped and swooped in the Bochk Private Banking Hcp (1650m). Chad Schofield sent him on a long, sustained run to boost his bank-balance to $HK 4.11 million. Millard declared Elusive State could be something special after his previous win last month. 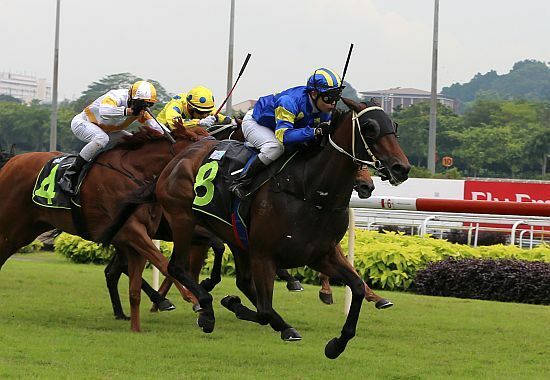 Silver Joy won his maiden in Singapore just minutes before Elusive State saluted for his latest win at Sha Tin. Silver Joy is a 3yo gelding from Swettenham Stud mare Rainbow Queen (Royal Academy). She is a winning half-sister to Group 2 winners Chase The Rainbow (Dash For Cash) and Ms Funovits (Reset). Monday, 28 January 2019 | All American’s Hong Kong import Dark Dream was a beaten favourite in the G1 Classic Mile on Sunday but lost no friends with a fast-finishing fourth behind stablemate Furore. Last year’s G1 Queensland Derby winner heads pre-post markets for the G1 Hong Kong Derby in March and was expected to benefit from the hit-out over 1600m at Sha Tin. He made up many lengths in the final furlong but was much the worse for wear when returning to scale. Thursday, 17 January 2019 | All American star Elusive State will qualify for the Dubai World Cup meeting if he can land another win - his sixth in a row – next time out in Hong Kong. Trainer Tony Millard is banking on another ratings boost to make the requisite level for the G2 Godolphin Mile (1600m) and G1 Dubai World Cup (2000m) at Meydan on March 30. Monday, 17 December 2018 | Kiwi filly Tiger Silk can become the third Group 1 classic winner in four years for Geisel Park Stud stallion All American. Trainer Richard Collett will make a decision after Christmas whether to set his filly for the G1 NZ Oaks (2400m) at Trentham on March 16. The Pukekohe-based conditioner was looking to the future with confidence after she came from last to win the Ross Roof Runner Hcp (1400m) at Ellerslie on Sunday. Friday, 7 December 2018 | Trainer Tony McEvoy will set his All American filly Despacito for a city campaign after an easy kill at Kyneton on Thursday. Heavily backed into an even-money favourite, Despacito was taken back to near last by Luke Currie after drawing wide in the Kyneton Electrics Maiden Plate (1450m). She was set alight approaching the corner and finished powerfully to win well. Monday, 26 November 2018 | Yankee Eyes is best left to run free in front and that strategy paid off again at Morphettville on Saturday. The promising daughter of All American controlled the Carlo Bittoto Memorial (1250m) and dug in for the fight when challenged in the straight by Zoustar fillies Kenyan Wonder and Be My Star.